Abstract: In this article I discuss how participatory action research (PAR) and game jams can be mutually enriching activities to achieve social transformation. PAR is a collaborative method where researchers and participants go through a cycle of reflection and action to understand and solve a collective challenge. Game jams are playful events where people from different disciplines build on collective knowledge to create game prototypes. The literature review is illustrated with eleven game jams held in Switzerland and Canada to create games for respiratory physiotherapy in cystic fibrosis, and to foster self-management in asthma. Together, game jams and PAR offer attractive and inclusive contexts to ease the appropriation of interdisciplinary knowledge, develop leadership and social skills, and foster civic engagement. Several kinds of gameplay—the rules of the games that inform the player experience—were collectively designed by the game jam participants. Seven prototypes (sidescrollers, puzzle, tower defense, point-and-click, narration) aim to ease the daily physiotherapy that children who have cystic fibrosis do to release the mucus in the lungs: The games use a breath-pressure-based controller to give visual biofeedback to the player. For example, the player drives a spaceship towards a destination—breathing in makes meteorites appear in front on the vessel, and breathing out allows to shoot at them with a laser. Three prototypes (sidescrollers) strive to motivate children to regularly self-assess their lung capacity: The games use a breath-flow-based controller to give visual biofeedback to the player. For example, the player blows intensely three times so that Easter statues 1. destroy buildings, 2. plant seeds, and 3. make rain to reinstate nature. Three prototypes (point-and-click, Tamagotchi (virtual pet), character customization) seek to teach children how to prevent and manage asthma crises (triggers, signals, medication use, etc. ): For example, the player collects objects and combines them to open doors and help characters be healthy. The game jams also allowed us to work on the financial viability and on community targeted communications about the initiative. The method for making the initiative financially sustainable was also better defined—as the games and the design of hardware are made freely available. By doing this, anyone is able to use and adapt the work so that it fits their needs. We involved patient associations, hospitals, universities, and networks of professionals before the events to ensure that key actors would be represented. Medical care professionals also helped us in defining key messages to deliver in the games. The setting was relatively similar in all game jams. The events in Switzerland took place during an international event dedicated to innovation and prototyping. These events were held over three to four days in downtown Geneva, Switzerland. Two zones were provided: an open space with seats, tables and bulletin boards, and a space in a prototyping lab, with seats, whiteboards, and movable elements. Food was provided. The event in Canada ran for two days in a modern, adaptable space at a university in downtown Montreal, Canada. The space included a classroom, and a working lounge. Food, a sleeping option, as well as computers and tablets, were provided. In both cases, documentation about the schedule, goals, and resources available was provided in advance. In the following illustration, I show how the facilitation process builds on TUCKMAN’s (1965) stages of group development, from the arrival of participants, where people invest little energy and do rituals, to the end of the event, where people divest their energy to move on to another activity. I co-facilitated all events with one or two other contributors. Tools that we actively used during the game jams are described hereafter, with examples. Documentation was mostly done on Google Drive, which enables different users to edit texts, spreadsheets, and presentations simultaneously. 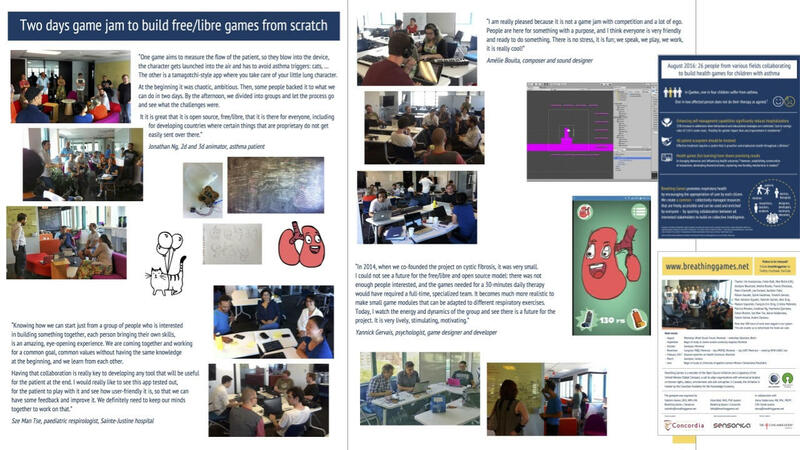 For the game jams, the facilitators created most documents, and participants completed them (for example promotional flyers, abstracts from medical literature, documents used by health professionals, game design document, images taken by participants, articles for congresses). Source code of the games and devices was registered on GitHub and later on GitLab (the latter being a free/libre version), a hosting service for software development that includes version control and access management systems. Most participants used this tool, as it enabled them to work simultaneously on the content of games and devices, without the risk of losing their individual work; for example, content produced by the game engine including code, images, sounds, and animations. 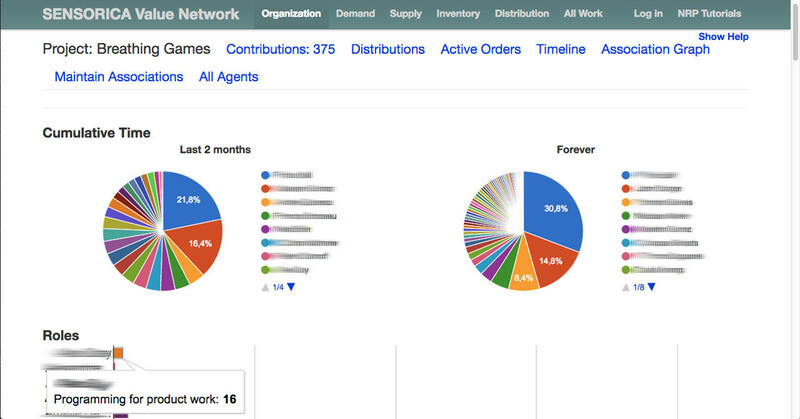 Contributions were logged into the Sensorica/Mikorizal Value Accounting System, a free/libre platform which enables a group to document contributions in time, material, and money; validate outcomes from peers; see the collective effort; and have funds redistributed via an algorithm. This system is key to the initiative, as it enables everyone everywhere to contribute to the project, and be acknowledged for their contribution. This makes collaboration more attractive than competition, as participants build on each other’s work instead of contending for an award; for example, 5 hours used for design and coordination, $25 pressure sensor bought, $100 donation received. Ambience and dynamics were captured through pictures, videos, and audio recording done by facilitators and participants. Time-lapse videos (pictures taken every n minutes and shown in fast-motion) were also done. In the second game jam, short interviews were done with participants to document their experiences, which were then broadcast online. This turned out to be an added value for all: an acknowledgment and new experience for participants, and a means to increase visibility for the initiative and its supporters. This gives voice to everyone, not only within the project or for research purposes, but also making the work accessible on the Internet. Participants could also be invited to film their own interviews and sequences. This fits with PAR practices where "experience has shown that, after appropriate training, the various research partners are well able to conduct these interviews" (BERGOLD & THOMAS, 2012, §67). In the first game jam for example, about 410 hours were spent together by 30 participants over three days. In the second game jam, 26 participants invested about 315 hours together over a weekend. The documentation produced—the videos and interviews in particular—provides a sneak peek into the human experience lived in such an activity. This could also become valuable research data for PAR, and be a topic for a publication collectively written by game jam participants. I thank Dr. Warren LINDS, professor in applied human sciences from Concordia University (Canada) for his review; Dr. Philippe CAIGNON, professor in linguistics from Concordia University (Canada) and Juan-Pablo PIMENTEL, PhD student at McGill University (Canada) for their valuable inputs; and Scot DEEMING, student in the Individualized PhD in humanities at Concordia University for the proofreading. I acknowledge all Breathing Games commoners who contributed to the game jams: O. ADNANE, A. AKL, C. ALTMIKUS, H. ALVES, J. ANASTASSIOU, R. AOUN, D. ARANGO, C. BALLI, F. BALSIGER, J. BANKS, M.A.L BARAHONA, A. BEDARD, K. BERTHIAUME, E. BIRKIN, R. BOATENG, M. BONNIVARD, J. BOUCHARD, J. BOUCHARD, A. BOUITA, J. BOUIX, E. BOULAY, M. BRANSI, D. BRASTAVICEANU, T. BRASTAVICEANU, A. BROCHU, M. BROECK, J. BROOKE, F. BROSSEAU, G. BROWN, P.-P. BRÛLÉ, P.-R. BURGEL, P. CAIGNON, L. CHABRE, F. CHEDEVERGNE, P. CHERNOFF, A. CHEVALIER, P. CHIUPPI, S. CHRIST, W. CHUNG, M. CLARICIA, D. CORREIA, K. COTTIER, M.-A. COTTING, S. COURCHESNE, T. DAGUENEL, J. DANGER, Q. DE HALLEUX, T. DE REYDET, A. DE ROMANA, L. DELVALLE, E. DESFORGES, G. DEVAUD, J. DEXTRAZE, N. DEXTRAZE, N. DODUIK, C. DRÉVO, K. DUNN, B. DUGAS, D. DUGUAY, T. DUONG, F.-X. DUPAS, V. DURAND, N. EBNOETHER, L.-T. FAN, D. FANGOUS, L. FERLAND, A. FOLIE, L. FOSTER, M. FRANGOS, D. GALAN, H. GAUDENZ, M. GAUDET, T. GAUDY, S. GEISER, S. GENDREAU, J.-S. GERVAIS, Y. GERVAIS, M.-A. GIGUÈRE, S. GINGRAS, S. GOBRON, B. GODOT, V. GOMEZ, V. GOZZI, A. GRAY, D. GRUNENWALD, I. GULIZIA, L. HARTMAN, M. HARTMEIER, B. HAUGEN, A. HAVAS, L. HUBER, G. HUGUENIN, H. HURTADO, C. IONESCU, M. IZQUIERDO, F. JEANNERET, L. JEANNERET, P. JURGAITIS, T. JUVET, F.-E. KING, M. KIRSZENBAUM, F. KNUCHEL, P. KOENIG, C. KOKER, S. LABERGE, B. LANGELLIER, M. LAUGERI, T.-R. LEBOEUF, P.-M. LEGRIS, G. LO PRESTI, S. LOZINSKI, A. LUSTRE, N. MAHANI, M.-A. MAHEU, M. MANCA, C. MAHNEKE, J.-E. MARCOTTE, N. MARQUIS, N. MARTIN, S. MARTINEZ, R. MARTISCHANG, D. MASSIE, N. MBUMBA, T. MEIER, J. MÉJANE, M. MELNYKOWYCZ, M. MENDELL, S. MEUNIER, P. MEYER, T.-L. MEYER, W. MILED, K. MITESKYY, F. MONCOMBLE, B. MOHAMED, B. MOHAMED, P. MORALES, C. MORASSE, P. NATAF, J. NG, T.-D. NGUYEN, I. ORTIZ, R. ORY, C. PACHE, L. PALOMINO, K. PICCAND, A. D. PIERSON, J.-P. PIMENTEL, L. POUGET, H. QUINTANA, E. RAELISON, D. REGAZZONI, C. REIERSON, S. RIVERIN, A. RIZZOTTI, A. ROMAN, A. ROMERO, L. ROPERS, P. ROSSEL, P. ROY, S. SANGANI, H. SANTOS, A. SAUTER, A. SCHNEIDER, M. STEPHAN, D. SEKULARAC, I. SERMET, P. SIGAM, J. SILVESTRINI, L. SIMON, C. SKRAPITS, R. STAUFFER, J. SUN, M. TAMPORELLO, M. THOMPSON, S.-M. TSE, A. VALDERRAMA, S. VARONE, S. VELLAS, F. VERMUELEN, Y. VEZINA, C. VOIROL, A. WEGMULLER, N. WENK, P. WILKINSON, J. WILLIMANN, L. XING, Q. YAROUB, A. ZALINI, C. ZALINI, A. ZANESCU, J. ZELTNER, Y. ZHAO. A synthesis of Breathing Games can be found at https://breathinggames.net/pub/bg_18_synthesis.pdf. Further information about the initiative including videos and documentation is available at https://www.breathinggames.net. The Canadian game jams were held thanks to the support of Sainte-Justine university hospital (health promotion center and research center), Sensorica, Concordia University, the Canadian Institutes for Health Research, Concordia Sustainability Action Fund, Blocsens. The Swiss game jams were held thanks to the support of a Swiss foundation, Lift Conference, OpenGeneva, the Genevan Foundation against Cystic Fibrosis (FGLM), the Swiss Game Center, the Genevan University Hospitals (HUG), the University of Applied Sciences Western Switzerland, Breathing Games Association. The proofreading was paid by the Canadian Institutes of Health Research. Arpola, Tiina & Holopainen, Arto (2014). Games for health game jams—fast and social development projects for health promotion. Finnish Journal of eHealth and eWelfare, 6, 209-212. Balcazar, Fabricio E.; Taylor, Renée R.; Kielhofner, Gary W.; Tamley, Karen; Benziger, Tom; Carlin, Nancy & Johnson, Sabrina (2004). Participatory action research: General principles and a study with a chronic health condition. In Leonard A. Jason, Christopher B. Keys, Yolanda Suarez-Balcazar, Renée R. Taylor & Margaret I. Davis (Eds. ), Participatory community research (pp.17-35). Worcester, MA: American Psychological Association. Balli, Fabio (2018). Lessons learned from the use of a participatory design process to develop digital games addressing airway clearance therapy in children with cystic fibrosis. JMIR Serious Games, https://doi.org/10.2196/games.8964 [Accessed: August 21, 2018]. Bergold, Jarg & Thomas, Stefan (2012). Participatory research methods: A methodological approach in motion. Forum Qualitative Sozialforschung / Forum: Qualitative Social Research, 13(1), Art. 30, http://dx.doi.org/10.17169/fqs-13.1.1801 [Accessed: August 21, 2018]. Berne, Eric (1959). Structure and dynamics of organizations and groups. New York, NY: Bantam Books. Clarkson, Petrūska (1991). Group imago and the stages of group development. Transactional Analysis Journal, 21(1), 36-50. Cook, Michael; Smith, Gillian; Thompson, Tommy; Togelius, Julian & Zook, Alex (2015). Hackademics: A case for game jams at academic conferences. In José Pablo Zagal, Esther MacCallum-Stewart & Julian Togelius (Eds. ), Proceedings of the 10th International Conference on the Foundations of Digital Games, Pacific Groove, CA, USA, June 22-25, 2015, http://julian.togelius.com/Cook2015Hackademics.pdf [Accessed: August 21, 2018]. Csikszentmihalyi, Mihaly (1990). Flow: The psychology of optimal experience. New York, NY: Harper & Row. Decker, Adrienne; Eiselt, Kurt & Voll, Kimberley (2015). Understanding and improving the culture of hackathons: Think global hack local. In IEEE (Ed. ), Proceedings of the 2015 IEEE Frontiers in Education Conference, El Paso, TX, USA, October 21-24, 2015. Dow, Steven P.; Heddleston, Kate & Klemmer, Scott R. (2009). The efficacy of prototyping under time constraints. In Nick Bryan-Kinns, Mark D. Gross, Hilary Johnson, Jack Ox & Ron Wakkary (Eds. ), Proceedings of the Seventh ACM Conference on Creativity and Cognition, Berkeley, CA, USA, October 26-30, 2009, https://hci.stanford.edu/publications/2009/PrototypingEfficacy-CC09/PrototypingEfficacy-CC09.pdf [Accessed: August 21, 2018]. Elden, Max & Levin, Morten (1991). Cogenerative learning: Bringing participation into action research. In William Foote Whyte (Ed. ), Participatory action research (pp.127-142). Newbury Park, CA: Sage. Fals-Borda, Orlando (1991). Remaking knowledge. In Orlando Fals-Borda & Muhammad Anisur Rahman (Eds. ), Action and knowledge: Breaking the monopoly with participatory action research (pp.146-164). New York, NY: APEX Press. Fenwick, Tara J. (2000). Expanding conceptions of experiential learning: A review of the five contemporary perspectives on cognition. Adult Education Quarterly, 50(4), 243-272. Fowler, Allan; Khosmood, Foaad; Arya, Ali & Lai, Gorm (2013). The global game jam for teaching and learning. Presentation, 26th Annual Conference of the National Advisory Committee on Computing Qualifications, Hamilton, New Zealand, October 6-9, 2013, https://www.citrenz.ac.nz/conferences/2013/pdf/2013CITRENZ_1_Fowler01-GlobalGameJam_v2.pdf [Accessed: August 21, 2018]. Freire, Paulo (1970). Pedagogy of the oppressed. New York, NY: Continuum. Green, Lawrence W.; George, M. Anne; Daniel, Mark; Frankish, C. James; Herbert, Carol J.; Bowie, William R. & O'Neil, Michel (1995). Study of participatory research in health promotion: Review and recommendations for the development of participatory research in health promotion in Canada. Ottawa: Royal Society of Canada. Greenhalgh, Trisha (2009). Chronic illness: Beyond the expert patient. BMJ, 338(b49), 629-631, http://discovery.ucl.ac.uk/15561/1/15561.pdf [Accessed: August 21, 2018]. Hall, Budd (1984). Research, commitment and action: The role of participatory research. International Review of Education, 30(3), 289-299. Hansson, Torsten (2014). 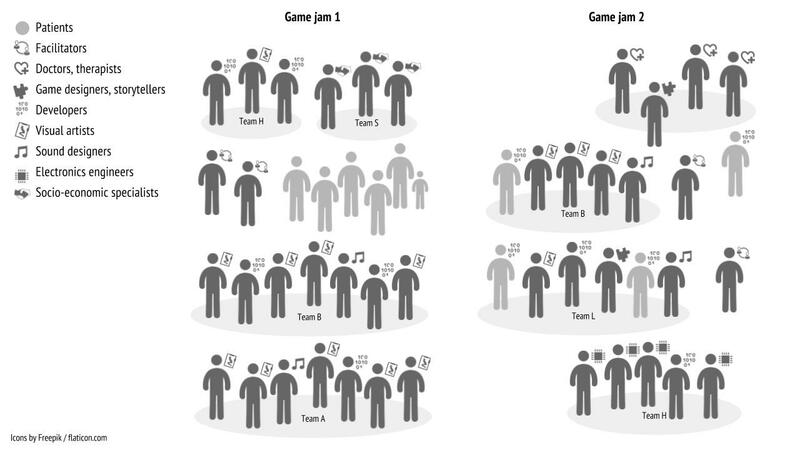 Enhancing game jam experiences: Finding more productive and focused group work interactions through establishing a framework. Master thesis, Malmö University, Sweden, https://dspace.mah.se/handle/2043/17047 [Accessed: August 21, 2018]. Higgins, Jane; Nairn, Karen & Sligo, Judith (2008). Peer research with youth. Negotiating (sub)cultural capital, place and participation in Aotearoa/New Zealand. In Sara Kindon, Rachel Pain & Mike Kesby (Eds. ), Participatory action research approaches and methods: Connecting people, participation and place (pp.104-111). London: Routledge. Hildebrand, Lisa (2012). Community members address health care challenges during hack-a-thon. Wisconsin Medical Journal, 111, 102-204, https://www.wisconsinmedicalsociety.org/_WMS/publications/wmj/pdf/111/3/102.pdf [Accessed: August 21, 2018]. Huizinga, Johan (1938). Homo ludens: A study of the play-element in culture. Boston, MA: Beacon Press. Ito, Kenji (2005). Possibilities of non-commercial games: The case of amateur role playing games designers in Japan. In Suzanne de Castell & Jennifer Jenson (Eds. ), Proceedings of Digital Games Research Association Conference, Vancouver, Canada, June 16-20, 2005, http://www.digra.org/wp-content/uploads/digital-library/06278.00101.pdf [Accessed: August 21, 2018]. Jull, Janet; Giles, Audrey & Graham, Ian D. (2017). Community-based participatory research and integrated knowledge translation: Advancing the co-creation of knowledge. Implementation Science, 12, 150-159, https://www.ncbi.nlm.nih.gov/pmc/articles/PMC5735911/ [Accessed: August 21, 2018]. Kindon, Sara; Pain, Rachel & Kesby, Mike (2008a). Introduction. Connecting people, participation and place. In Sara Kindon, Rachel Pain & Mike Kesby (Eds. ), Participatory action research approaches and methods: Connecting people, participation and place (pp.1-5). London: Routledge. Kindon, Sara; Pain, Rachel & Kesby, Mike (2008b). Participatory action research: Origins, approaches and methods. In Sara Kindon, Rachel Pain & Mike Kesby (Eds. ), Participatory action research approaches and methods: Connecting people, participation and place (pp.9-18). London: Routledge. Kothari, Uma (2005) Authority and expertise: The professionalisation of international development and the ordering of dissent. Antipode, 37(3), 425-446. Laugeri, Madeleine (2015). Les clés du dialogue hiérarchique [The keys to the hierarchical dialogue]. Paris: InterEditions. Law, John (2004). After method: Mess in social science research. New York, NY: Routeledge. Lewin, Kurt (1946). Action research and minority problems. Journal of Social Issues, 2(4), 34-46. Lincoln, Yvonne S. (1995). Emerging criteria for quality in qualitative and interpretive research. Qualitative Inquiry, 1, 275-289. MacDonald, Cathy (2012). Understanding participatory action research: A qualitative research methodology option. Canadian Journal of Action Research, 13(2), 34-50, http://journals.nipissingu.ca/index.php/cjar/article/viewFile/37/33 [Accessed: August 21, 2018]. Manzo, Lynne C. & Brightbill, Nathan (2008). Toward a participatory ethics. In Sara Kindon, Rachel Pain & Mike Kesby (Eds. ), Participatory action research approaches and methods: Connecting people, participation and place (pp.33-40). London: Routledge. Musil, Juergen; Schweda, Angelika; Winkler, Dietmar & Biffl, Stefan (2010). Synthesized essence: What game jams teach about prototyping of new software products. In IEEE (Ed. ), Proceedings of the 2010 ACM/IEEE 32nd International Conference on Software Engineering, Cape Town, South Africa, May 2-8, 2010. O'Brien, Liz; Marzano, Mariella & White, Rehema M. (2013). "Participatory interdisciplinarity": Towards the integration of disciplinary diversity with stakeholder engagement for new models of knowledge production. Science and Public Policy, 40, 51-60. Pain, Rachel; Kindon, Sara & Kesby, Mike (2008). Participatory action research: Making a difference to theory. In Sara Kindon, Rachel Pain & Mike Kesby (Eds. ), Participatory action research approaches and methods: Connecting people, participation and place (pp.26-32). London: Routledge. Pirker, Johanna & Voll, Kimberly (2015). Group forming processes—experiences and best practice from different game jams. In Li "Albert" Boyang & Nelson Mark (Eds. ), Proceedings of the Foundations of Digital Games Conference, Pacific Groove, CA, USA, June 22-25, 2015, https://jpirker.com/wp-content/uploads/2013/09/final.pdf [Accessed: August 21, 2018]. Preston, Jon A. (2014). Serious game development: Case study of the 2013 CDC games for health game jam. In Stefan Göbel, Wolfgang Effelsberg, Thomas Baranowski, Mark Claypool, Ralf Dörner & Florian "Floyd" Mueller (Eds. ), Proceedings of the 2014 ACM International Workshop on Serious Games, Orlando, FL, USA, November 3-14, 2014. Preston, Jon A.; Chastine, Jeff; O'Donnell, Casey; Tseng, Tony & MacIntyre, Blair (2012). Game jams: Community, motivations, and learning among jammers. International Journal of Game-Based Learning, 2(3), 51-70. Rahman, Muhammad Anisur (1991). The theoretical standpoint of PAR. In Orlando Fals-Borda & Muhammad Anisur Rahman (Eds. ), Action and knowledge: Breaking the monopoly with participatory action research (pp.13-23). New York, NY: APEX Press. Reng, Lars; Schoenau-Fog, Henrik & Busk Kofoed, Lise B. (2013). The motivational power of game communities—engaged through game jamming. In Mark J. Nelson (Ed. ), Proceedings of the 8th International Conference on the Foundations of Digital Games, Crete, Greece, May 14-17, 2013, http://www.fdg2013.org/program/workshops/papers/GGJ2013/ggj13_submission_2.pdf [Accessed: August 21, 2018]. Riecken, Ted; Strong-Wilson, Teresa; Conibear, Frank; Michel, Corrine & Riecken, Janet (2005). Connecting, speaking, listening: Toward an ethics of voice with/in participatory action research. Forum Qualitative Sozialforschung / Forum: Qualitative Social Research, 6(1), Art. 26, http://dx.doi.org/10.17169/fqs-6.1.533 [Accessed: August 21, 2018]. Shin, Kiyoshi; Kaneko, Kosuke; Matsui, Yu; Mikami, Koji; Nagaku, Masaru; Nakabayashi, Toshifumi; Ono, Kenji & Yamane, Shinji R. (2012). Localizing global game jam: Designing game development for collaborative learning in the social context. In Anton Nijholt, Teresa Romão, Dennis Reidsma (Eds. ), Advances in computer entertainment (pp.117-132). Berlin: Springer. Scott, Michael James & Ghinea, Gheoghita (2013). Promoting game accessibility: Experiencing an induction on inclusive design practice at the global games jam. In Allan Fowler (Ed. ), Proceedings of the Inaugural Workshop on the Global Games Jam (2013), Santa Cruz, CA, USA, May 14, 2013, https://arxiv.org/pdf/1305.4359.pdf [Accessed: August 21, 2018]. Tavares, José Pedro & Roque, Licínio (2007). Games 2.0: Participatory game creation. Presentation, Simpósio Brasileiro de Games e Entretenimento Digital, Curitiba, Brazil, November 2-4, 2017, https://sbgames.org/papers/sbgames07/gameandculture/short/gcs2.pdf [Accessed: August 21, 2018]. Tuckman, Bruce W. (1965). Developmental sequence in small groups. Psychological Bulletin, 63, 384-399. Turner, Thomas L. & Owen, C. (2013). Living the indie life: Mapping creative teams in a 48 hour game jam and playing with data. In Stefan Greuter, Christian McCrea, Florian Mueller, Larissa Hjorth & Deborah Richards (Eds. ), Proceedings of The 9th Australasian Conference on Interactive Entertainment, Melbourne, Australia, September 30-October 1, 2013, https://dl.acm.org/citation.cfm?id=2513039 [Accessed: August 21, 2018]. Zook, Alexander & Riedl, Mark O. (2013). Game conceptualization and development processes in the global game jam. In Mark J. Nelson (Ed. ), Workshop Proceedings of the 8th International Conference on the Foundations of Digital Games, Chania, Greece, May 14-17, 2013, http://www.fdg2013.org/program/workshops/papers/GGJ2013/ggj13_submission_4.pdf [Accessed: August 21, 2018]. Whyte, William Foote (1991). Introduction. In William Foote Whyte (Ed. ), Participatory action research (pp.7-18). Newbury Park, CA: Sage. Fabio BALLI leads Breathing Games, an open-access commons that encourages everyone to take care of respiratory health with play. He does an individualized PhD in social sciences at Concordia University, Tiohtiá:ke/Montreal, Canada. He benefits of ten years of experience in local and international organizations, where he has lead social transformation processes, and provided training and mentoring. Among others, Fabio BALLI holds a Swiss Masters of Advanced Studies in human systems engineering. Balli, Fabio (2018). Game Jams to Co-Create Respiratory Health Games Prototypes as Participatory Research Methodology [71 paragraphs]. Forum Qualitative Sozialforschung / Forum: Qualitative Social Research, 19(3), Art. 35, http://dx.doi.org/10.17169/fqs-19.3.2734.